Last Tuesday when I was at the booth, the mall was putting up Christmas decorations. I, in my newbie-seller wisdom commented that it's just too soon, it makes me nervous, etc., but it got me thinking. October was... not good, sales wise for me. I need to actually make some sales for the holidays, and step things up. I almost backed out of the weekend's road trip to spend a couple of days totally revamping my booth, but... obviously, I didn't. So I'm just going to have to go a bit at a time and see what I can do. So today, I started on the clothing side of things. I went in and pulled out all the Halloween stuff, and all the stuff that's really just not appropriate for the weather anymore, and added in coats and jackets and dresses. Some of these are things I had in there when I first opened up shop last February, some are newer finds I have picked up at estate sales and thrift shops over the last few months. I think all of them are pretty fabulous. What do you think? The all blue is a long-sleeved, zip-front number with handy pockets. It's got more shape to it than shows here. While I was there swapping it all out, a gentleman stopped into the booth and looked at a few items and commented that in his opinion, I have a good eye. It pretty much made my day to hear that after just barely breaking even for the month of October. He didn't buy anything, but a bit of encouragement's worth something too! Me and My Shadow's Magpie Monday, Coastal Charm's Nifty Thrifty Tuesday. Tiny gold space man bank. Who might actually be a scuba man instead. Pretty/funky vintage floral fabric scrap. turned into the front half of a dress! gray river stone just below it in the picture. I can never resist picking up a good rock! So what about you guys? Any great treasures lately? 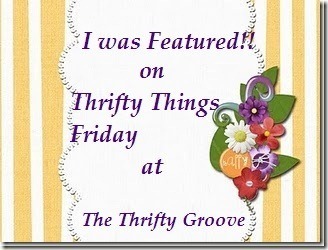 If you want to see some other folks' treasures, check out The Thrifty Groove's Thrifty Things Friday link-up! So here's the thing. Barbie... she's maybe not that good for girls. I know, I get it. And I don't particularly care for her. Now. But when I was a kid, she was a great outlet for a vivid imagination. The weeds along the fence in the back yard were a vast jungle. The bathroom sink was a huge luxury Jacuzzi. The cat was a panther, the basement was a great place for a road trip for Barbie in our awesome Tonka Winnebago (she had to lay down - she was a bit too tall for it), and eye shadow rubbed into her hair was great for giving Barbie a little punk edge! Also, her head and limbs sometimes came off, which was funny - you could (just about) cram her head on Ken and vice versa, on some models. And that's not even getting to all the cool clothes, and the zillions of ways you could mix and match if you had enough of them. I put a yellow cowgirl shirt on her over a ballgown skirt and thought I was a true fashion rebel. So what I'm saying is, good for me or not, I quite liked Barbie when I was a little girl. But that was long after her debut. Today I learned just how much baggage the old girl truly carries. Today, I found The Barbie Game: Queen of the Prom. Très vintage! Apparently when she was young Barbie was allowed colors other than pink! See? you can't beat Barbie for the fashions! Barbie's profile on the money! Get the boyfriend to "go steady"
was kind of the Barbie game version of The Dud. Ok, I'll admit it, once in awhile I wouldn't mind somebody shuffling the boyfriend cards for me! Do you see those "on a date" squares? "HE CRITICIZES YOUR HAIR-DO. GO TO BEAUTY SHOP"
So yeah, vapid, limiting and sexist, but Barbie's been an astronaut since then, and anyway it's so, so pretty to look at! 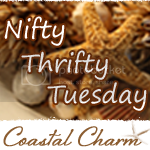 Me and My Shadow's Magpie Monday and Coastal Charm's Nifty Thrifty Tuesday. Check them out!